You may have seen something similar in a stage version from Martin Lewis. Ralf got his inspiration from Martin's effect and worked out a pocket version of it that uses a sticky note pad. 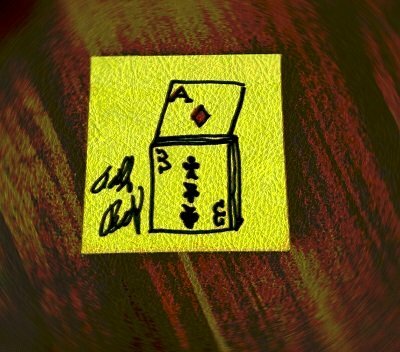 Effect: Draw a wrong prediction of a playing card on a sticky note pad. The chosen card rises out of the same picture. Give it away as an impossible souvenir. 1st edition 2014, length 28 min 26 sec. Great trick and a great value for the price! Similar tricks are on the market and are very expensive. The video delivers exactly what is promised. The guy on the video is easy to understand and steps are easy to see and do. I made the gimmick in less than an hour. Highly recommended to the magician looking for a super close-up/walk around/table trick that plays big and packs small. I was really going to purchase another effect, but this one caught my eye. I am not an origami/paper folding type person, but this was none of that. With just a glue stick, scissors, tape and a couple of other things plus about one half hour you can have the device made. (I do plan on making a more professional looking one, but my prototype works fine.) The MP4 session is twenty-eight minutes long, very concise and the spoken English is no problem. I don't think I will have the post it note signed as it happens after the card rise, but other than that, this is a gem. For a $5.00 investment and some items you probably already have lying around the house, you can't go wrong. If you find anything wrong with this product listing, perhaps the description is wrong, the author is incorrect, or it is listed in the wrong category, then please contact us. We will promptly address your feedback.